Buying the church at the auction (£170k), plus fees and the costs of insurance (£2k) and getting the building’s electrics certified (£1k) and other things that are essential to open to the public have wiped out nearly all of the money that was donated or loaned to us. So we now need all the help we can get with quick funds in order to be able to get up and running as quickly as possible. Here’s one great opportunity, but act quickly – we only have a couple days. 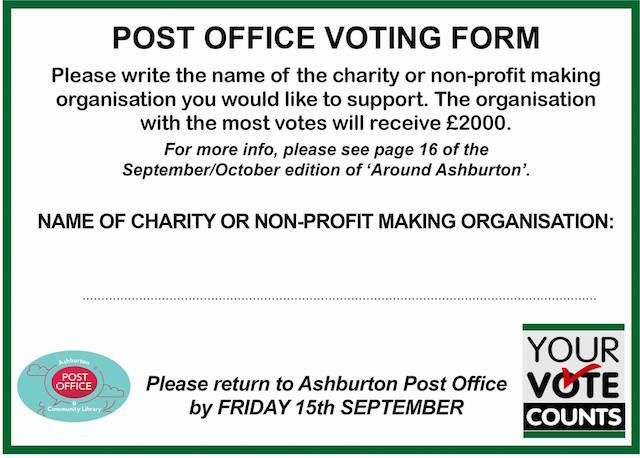 Post Office Voting Form – print it out, write ‘Ashburton Arts’ on the dotted line, plus your signature (one vote per person), then drop it into Ashburton Post Office before it closes at 6pm on Friday 15 Sept (or drop it though the letterbox if you’re late – the count is on Saturday morning). The PDF has two copies of the form – tear it in half and get someone else to vote for us with the other one. Prev We bought the Church! This is all great – so good for Ashburton; as a relative newcomer I really appreciate all that is being done to continuously ‘up’ the music offerings in this town. It’s really impressive!